Oil central heating with open fire. 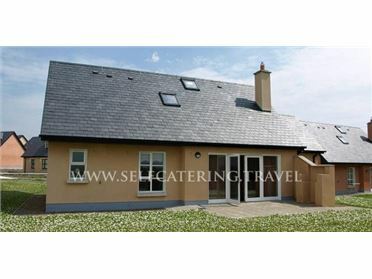 Electric oven and hob, microwave, fridge/freezer, washing machine, tumble dryer, dishwasher, TV with Saorview, WiFi, selection of games. Fuel, power and starter pack for fire inc. in rent. Bed linen and towels inc. in rent. Cot and highchair on request. Off road parking for 4 cars. Surrounding lawned gardens with patio and furniture. Sorry no pets and no smoking. Shop and pub 4 miles. .